The Gyroplane Laboratoire was an early helicopter. Its designer, Frenchman Louis Breguet, had already experimented with rotorcraft in 1909, however, he chose to concentrate on airplanes until the end of the 1920s. In 1929 he announced a set of patents which addressed the flight stabilization of rotorcraft, and, in 1931, Breguet created the Syndicat d'Etudes de Gyroplane (French for "Syndicate for Gyroplane Studies"), together with Rene Dorand as technical director. 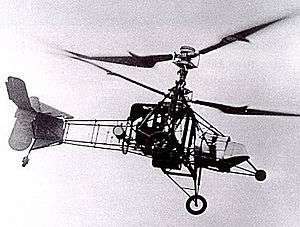 Their goal was the development of an experimental helicopter, the Gyroplane Laboratoire. The aircraft consisted of an open steel tube framework, within which the engine, fuel tank, controls and pilot were situated, together with a tail assembly with plywood tail surfaces. The tailwheel landing gear was installed with the mainwheels on outriggers and with an additional small wheel at the front to avoid nosing-over during landing. Power was provided by a 240 HP Hispano radial engine which propelled the two contra-rotating, coaxial rotors. The coaxial rotor design was chosen because with the rotors turning in opposite directions the torque from one rotor was canceled out by the torque produced by the other rotor. The two twin-bladed rotors made of metal were shaped like arrows and incorporated both cyclic and collective pitch blade control, with which movement around the pitch and roll axis was controlled, as well as climb and descent. The Gyroplane Laboratoire and its accomplishments were soon overshadowed by the German Fw 61. Breguet and Dorand continued to conduct further experiments to improve the design until the aircraft experienced a hard landing in June 1939. Development was abandoned with the outbreak of World War II. The only prototype was destroyed in 1943 during an Allied air attack on the airfield at Villacoublay. ↑ Pearce, William. "Dorand Gyroplane G.20 (G.II)". oldmachinepress.com. Retrieved 17 May 2016. ↑ "FAI Record ID #13061 - Distance over a closed circuit without landing. Class E former G (Helicopters), piston " Fédération Aéronautique Internationale (FAI). Retrieved: 21 September 2014. ↑ "FAI Record ID #13060 - Speed over a straight 15/25 km course. Class E former G (Helicopters), piston " Fédération Aéronautique Internationale (FAI). Retrieved: 21 September 2014. This article originally translated from the German Wikipedia. Munson, Kenneth (1968). Helicopters and other rotorcraft since 1907. London: Blandford P. ISBN 9780713704938.